"I love these monthly relaxation massages, ahem, I mean skin checks." Cancer is a terrifying thought for any pet owner. Fortunately, the chances of your cat suffering liposarcoma, a slow-growing, non-painful cancer of the fat tissue, are slim. However, if Kitty happens to suffer this rare cancer, with proper diagnosis and treatment, the Veterinary Society of Surgical Oncology lists her prognosis as guarded to good. Liposarcomas are soft, squishy, malignant lumps underneath your cat’s skin. They typically measure 2 cm or more in diameter and rarely ulcerate, or break the skin, though larger masses have a higher risk of doing so. Made up of fat cells, liposarcomas form most commonly on a cat’s legs. Fortunately, this type of cancer rarely metastasizes, or spreads to other tissues and organs in your cat’s body. Your veterinarian will examine your buddy for any lumps and bumps during her yearly wellness exam. Liposarcomas can feel and look like harmless cysts or fatty masses called lipomas. Older cats especially are prone to this form of cancer, so your veterinarian likely will opt for a needle aspiration or to remove the mass entirely as a precaution. A needle aspiration sounds scary, but it’s relatively painless for kitty, and simply involves drawing some cells out of the lump with a small needle and sending them to the pathology lab for accurate identification. Treatment for liposarcoma almost always involves surgical removal of the cancerous mass. The mass itself as well as a bit of tissue surrounding the mass typically are removed during surgery. The exact size of the excision will depend on the diameter and location of Kitty’s liposarcoma. Liposarcoma has a high risk of recurrence so your veterinarian also may recommend radiation therapy to kill any remaining cancerous cells. The feline leukemia virus may contribute to the development of liposarcoma in some cats. 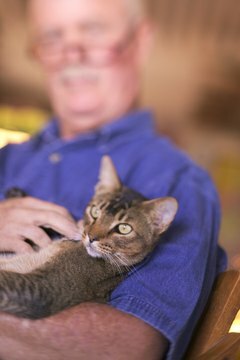 Giving Kitty the feline leukemia vaccine could help prevent some, but not all, occurrences of liposarcoma. Early detection, however, is one of the most effective ways to prevent large liposarcomas. Begin checking your cat monthly for any lumps and bumps when she’s a kitten. Give her a gentle, full-body massage while checking for any hard lumps, those that feel like frozen peas, as well as fatty lumps, which will feel free-floating and squishy like a cooked lima bean. Any new masses, especially those that increase in size, should have a veterinary evaluation. What Are the Treatments for Squamous Cell Cancer in White Cats?